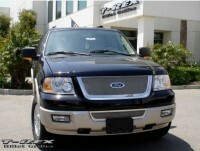 54590: 03-06 Ford Expedition (All Models) Upper Class Stainless Steel Mesh Grille. This high quality stainless steel mesh style grille comes finished in a sparkling mirror chrome finish. Remove OE factory grille and replace with mesh grille. Hardware and installation instructions are included. Ford emblem maybe removed from OE factory grille and re-used if desired but is not necessary. Installation time is about 1hr. Matching bumper grille is also available above as additional item. Backed by manufacturers five year warranty. Made in USA. Tell your friends about the Upper Class Chrome Mesh Grille. Share this product on Facebook, Twitter, MySpace or send an email to a friend!